When much of the year is spent with scant natural light, as it is in Norway, Sweden, and Denmark, the desire to capture that light leads to high ceilings and lots of windows. Major color areas are often high key, like the mist-colored walls, area rug, and metal window frames, and the white sofa and table top of this home. Yes, the bottom window can slide up when there's enough warmth to let in a summer zephyr, and that wood overhang atop the windows can keep out too much sun, as well as rain and snow. 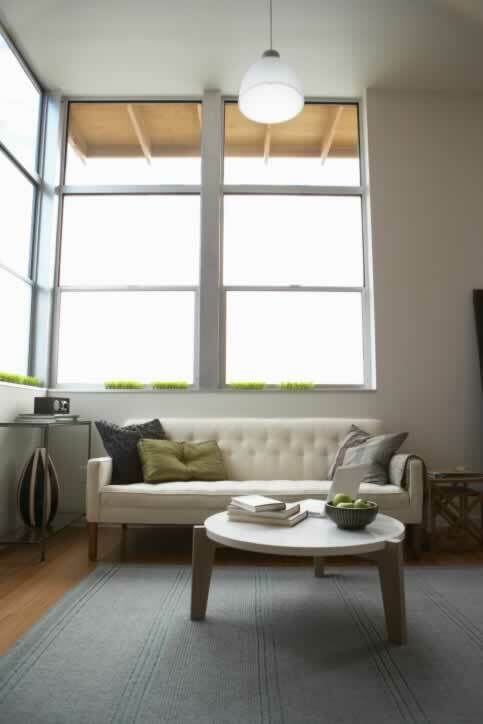 The high ceilings help compensate visually for the amount of confinement dictated by the long winters. All accent colors in this room take their cue from nature, from the warm wood floors and table legs to the leaf-green pillow and spring-green ornamental glass pieces on the window sills. If you love understatement, this room's for you.